One of the most commonly affected organs systems in Down syndrome is the cardiovascular system. As many as 60 percent of children with Down syndrome are born with a defect of the heart—a figure that is seen in countries around the world. In fact, as many as one in ten cases of all inborn heart defects occurs in babies with Down syndrome. In infants with Down syndrome, heart defects are by far the leading cause of death before the age of two. Sadly, virtually all of the heart defects in this syndrome require surgical intervention in order to correct and, as a result, the mortality rate in newborns with Trisomy 21 is high in less developed countries. In order to understand what occurs in the hearts of babies with Down syndrome, it is first necessary to know how the heart functions in its normal state and how this is a little different before and after a child is born. In a newborn baby, and for the rest of the baby’s life, blood is constantly being filled with oxygen by the lungs for use by the body. Thus a drop of blood gets pumped from the right side of the heart, through atrium and ventricle to the lungs. In the lungs that drop of blood picks up oxygen and immediately travels back to the heart. The drop moves through left atrium then left ventricle, for the big squeeze toward the rest of the body. Our little drop of blood then dumps its oxygen off to the tissues as it passes through small vessels called capillaries. The drop of blood is like a little dump truck, delivering its load, then making its way back to the right heart for another pickup.On and on the cycle goes; oxygenated and deoxygenated blood making its way to the tissues and to the lungs, respectively. The right side of the heart does not connect to the left side of the heart because oxygenated blood should not mix with deoxygenated blood. If it did, the tissues would get partially deoxygenated blood and the lungs would be presented with blood that already has some oxygen in it. This would waste energy at best, and dangerously deprive the tissues (like brain, liver, and kidneys) of much needed oxygen at worst. Unfortunately in Down syndrome, this system often does not form as it should. Thus babies with Down syndrome often have serious problems delivering oxygen to the body and to the brain. As a fetus, the circulation is different. Blood comes from the mother, across the placenta. The blood travels through the umbilical cord and moves through the body being pumped by a fetal heart. Since the lungs are not used (no air in the womb! ), there is really no reason to keep the right and left hearts separate. In fact, blood intermingles quite extensively in the fetal circulatory system without any problem. In preparation for birth, the right and left blood vessel systems develop and, within a few hours of the lungs taking their first breath, the blood vessel system takes the two-sided form that will serve as the circulatory system for the rest of the person’s life. In Down syndrome, one or more of a number of heart defects can occur. They often lead to life-threatening and even lethal structural heart abnormalities. Congenital heart defects occur in 40 to 60 percent of all children born with Down syndrome. Some of the more common heart defects that occur in Trisomy 21 are endocardial cushion defect, ventricular septal defect, atrial septal defect, tetralogy of Fallot, and isolated patent ductus arteriosus. The frequency at which they occur is given in the Table. Endocardial cushion defect is the most common cardiac abnormalities present at birth in newborns with Down syndrome. It occurs when the walls between the chambers of the heart do not fully form. A heart with this abnormality, also called an atrioventricular canal, effectively has one large chamber, instead of four. Oxygenated and deoxygenated blood can intermingle within the heart in this case. Before the child is born, there is no real problem, considering the fetal circulation. 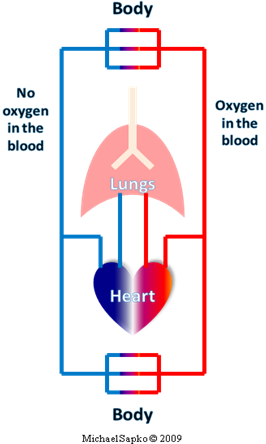 However after birth, instead of fully oxygenated blood travelling to the tissues and deoxygenated blood flowing to the lungs, the blood is mixed within the heart and blood that is pumped to the other organs does not have enough oxygen in it. This causes the tissues to become starved of oxygen. Also, the blood being pumped to the lungs is under much higher pressure which leads to problems in the blood vessels of the lungs. By the same token, blood pumped to the rest of the body does not travel with enough pressure. This means that the organs and tissues do not get adequate blood flow. Ventricular and atrial septal defects are the second and third most common heart ailments in neonates with Trisomy 21. Atria, the top chambers of the heart, and ventricles, the chambers on bottom, are usually separated by a thick wall or septum. When this septum is not properly formed, blood with and without oxygen can mix, causing problems similar to an endocardial cushion defect. Since ventricular and atrial septal defects are usually less severe than the structural problems of endocardial cushion defect, symptoms may exist to a lesser degree. Stenosis is a medical term that describes a situation of impeded flow, usually of blood through a vessel. Pulmonic stenosis, the fourth most common congenital heart defect in Down syndrome, describes blood flow from the right side of the heart that is partially blocked or impeded on its way to the lungs. If the stenosis is mild, the child may not have many symptoms. What usually occurs in pulmonic stenosis, however, is extreme fatigue and shortness of breath with only mild exertion. Since the body needs to deliver more oxygen to the body during exercise, blood pressure increases and the blood circulates more quickly through the body. But if the blood flow to the lungs is restricted, as in pulmonic stenosis, the blood does not receive as much oxygen from the lungs. This results in shortness of breath and fatigue. Pulmonic stenosis often occurs in conjunction with patent ductus arteriosis. Recall that the circulatory system in the newborn is set up quite differently than it is just after birth and throughout life. The conversion between the prenatal and postnatal systems requires the closure of a small blood vessel called the ductus arteriosis. The ductus arteriosis connects two major blood vessels in the chest and basically shunts the blood away from the lungs, since the lungs are not used when baby is in the womb. As you can imagine, if this blood vessel stays open after birth, blood flow to the lungs is insufficient. Patent ductus arteriosis is state in which this blood vessel remains open or patent. Tetralogy of Fallot is a collection of four (tetralogy) structural heart defects named after the French physician Etienne Fallot. Two of the four abnormalities are described above, pulmonary stenosis and ventricular septal defect. The other two features of the tetralogy are overriding aorta and right ventricular hypertrophy. The aorta is the large artery that carries oxygenated blood from the left ventricle to the body. When the septum of the ventricle is defective, the aorta may receive blood flow from both ventricles and thus the aorta is said to by “overiding” (it rides over the right ventricle). In this state, the heart must pump with incredible force. The heart, like any muscle, grows when it is worked; the more vigorous the workout, the more muscle that is created in response. The right ventricle usually only needs to pump blood to the nearby lungs, requiring little pressure and work. With an overriding aorta, the right ventricle senses the increased resistance and workload and pumps with more force than it was ever intended to provide. The right ventricular hypertrophy, or abnormally large growth of muscle in the right ventricle, occurs in response to this increased load. Fortunately since these congenital heart defects are so common, obstetricians and pediatricians are vigilant for their detection and diagnosis. Many of these heart defects can be detected with the same technology that is used to visualize an infant within the womb: ultrasound. When performed to look at the internal structures of the heart, the ultrasound is referred to as an echocardiogram. This can be performed without radiation and without pain to infants as soon as they are born and stabilized. In fact, it is sometimes possible make the diagnosis of a structural heart defect while the fetus is still in the womb! Early detection and correction of these structural abnormalities is vitally important in assuring that a child with Down syndrome can make it to his or her second birthday and beyond. These defects are the leading cause of death in babies with Down syndrome under the age of two. Some defects, such as patent ductus arteriosis, can be corrected medically if they are detected early. A simple injection can force this small, patent blood vessel to close, for example. However most structural heart problems require surgical intervention, and in fairly short order. The surgical treatment of congenital heart defects occurring in Down syndrome has improved dramatically over the past 15 years since pediatric cardiology became widely recognized as its own professional specialty. Surgery to correct many of these heart malformations can be performed soon after birth. Quite remarkably, some pediatric cardiothoracic surgeons are pioneering efforts to perform the life-saving surgery before birth, while the infant is still in the womb. While three copies of chromosome 21 causes a myriad of health and developmental problems, an extra copy of some of the genes on this chromosome is believed to lead to protective benefits. For example, that rate at which solid cancerous tumors form in people with Down syndrome is lower than the rest of the population. Recent work published in the journal Nature suggests that this may be due to the cancer suppressing gene called DSCR1, found on chromosome 21. It was first noted in the 1970s that atherosclerosis (diseased blood vessels) may be lower in Down syndrome than in those without the chromosomal abnormality. While children with Down syndrome may be born with serious heart defects, their arteries are relatively protected from subsequent disease. The reasons for this are unclear but it may be due to reduced cardiovascular risk factors and a lowered incidence in diseases that lead to vascular disease, like diabetes. Unfortunately, there is a strong link between Alzheimer’s disease and Trisomy 21—approximately 75 percent of individuals with Down syndrome go on to develop Alzheimer’s disease. Alzheimer’s disease leads to increased levels of amyloid in tissues (amyloidosis) which can subsequently lead to blood vessel damage. Therefore while atherosclerosis is seen less often and less severely in those with Down syndrome, other issues that may lead to blood vessel disease. The effects of having three copies of chromosome 21 are varied and complex. This is certainly true when it comes to heart disease and Down syndrome. There are a host of structural abnormalities that occur in the heart, abnormalities that need to be detected and repaired early in the child’s life. Once successfully repaired, children and adults with Down syndrome can go on to lead productive and fulfilling lives. For more information, please visit the National Down Syndrome Society website at www.ndss.org. De Rubens Figueroa J, del Pozzo Magaña B, Pablos Hach JL, Calderón Jiménez C, Castrejón Urbina R. [Heart malformations in children with Down syndrome] Rev Esp Cardiol 2003 Sep;56(9):894-9. Ferencz C, Neill CA, Boughman JA, et al. Congenital cardiovascular malformations associated with chromosome abnormalities: an epidemiologic study. J Pediatr Jan 1989;114(1):79-86. Greenwood RD, Nadas AS. The clinical course of cardiac disease in Down Syndrome. Pediatrics Dec 1976;58(6):893-7. Marino B. Congenital heart disease in patients with Down syndrome: anatomic and genetic aspects. Biomed Pharmacother. 1993;47(5):197-200. Stoll C, Alembik Y, Dott B, Roth MP. Study of Down syndrome in 238,942 consecutive births.Ann Genet 1998;41:44-51.